Today we’re introducing retrieval practice – in other words, bringing information to mind. How does retrieval practice help learning? Retrieval practice is beneficial in many ways. The more obvious way is that doing something like a practice quiz can help you figure out what you don’t know. That’s one example of an “indirect” benefit of retrieval practice: figuring out what you know and what you don’t know leads you to do something that causes learning. But, lots of studies have also shown direct effects of retrieval practice: the act itself of bringing information to mind makes it more durable. For more on the various direct and indirect benefits of retrieval practice, see this post. Do students practice retrieval on their own? The answer is no. While students often do use quizzes as a check of how much they've learned, very few of them list retrieval practice as their go-to study strategy (1). Why not? Well, it’s hard. While doing retrieval practice, it can feel like you don’t know much – and that feels bad. This leads students to be underconfident after practicing retrieval, compared to overconfident after re-reading. For more on this illusion, see this blog post about predicted and actual learning. Megan tells an anecdote about students who come to her office and say they studied and studied – why didn't they do well? It’s probably because they didn't use effective study strategies! Another reason why students may not practice retrieval as often as they should is that the benefits of retrieval are delayed. Retrieval is better in the long-run - it produces durable learning - but it might not feel like it’s “working” while students are actually doing it. How can teachers integrate retrieval practice into their classrooms? There are many different ways for students to practice retrieval – it doesn’t have to be with a formal quiz or test. Yana’s colleague, Dr. Miko Wilford, likes to play Jeopardy with her students to help them get ready for exams. You can also do starter or exit questions, which can be low or even no stakes. You can ask students to write from memory, answer open-ended questions, draw from memory, and even create concept maps from memory (3). Be careful with having students create their own questions, though – it may not be worth it (4). Prompting questions might also help – though not always (but at least, they shouldn’t hurt). See this blog post for Megan’s recent study on retrieval practice with prompts (5). Students actually really like frequent quizzing once they get used to it. Megan and Dr. Cindy Nebel (formerly Cindy Wooldridge) recently went to Columbus State Community College to talk to instructors there, and one of the professors, Felicia Smith, talked about giving daily quizzes in some of her classes, and how students who’d experienced this reacted when they took her other classes in which she didn’t use daily quizzing. "I quiz because I care." (For Althea’s latest guest post on our blog, see here). 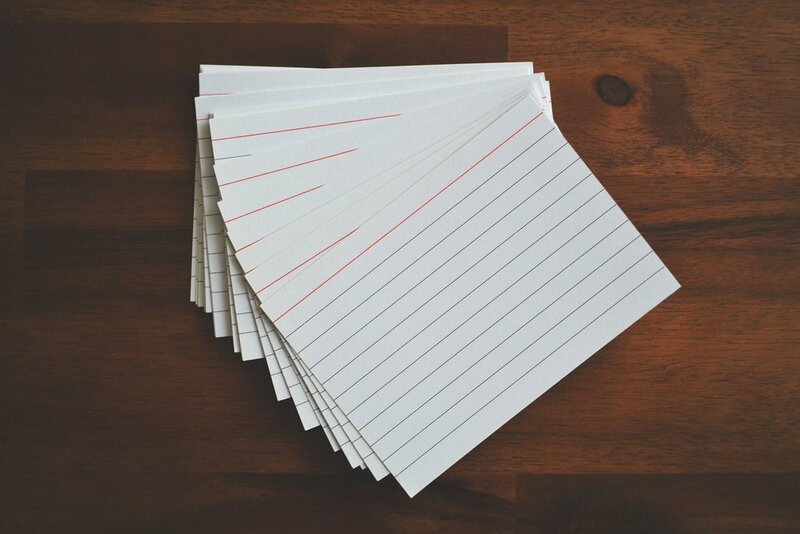 Flashcards can be a good way for students to practice retrieval on their own, but they have to make sure they are doing it properly: actually trying to retrieve, rather than just flipping the card. A group of students in Yana’s class recently claimed that making flashcards rather than using them to practice retrieval was what helped them learn. You’ll have to listen to the podcast to find out what happened with that hypothesis! For a different twist on flashcards, see this method described by college student Rachel Adragna, which goes beyond using flashcards for retrieving key terms and definitions –encouraging students instead to think more deeply and in new ways about the information they’re trying to learn. One last thing: Students should not stop studying when they think they’ve learned the information. Repeated retrieval, even after retrieval success, is critical for long-term learning (6), (7). We hope you enjoyed this podcast! Check back in 2 weeks, when we’ll be releasing a “bite-size research” episode describe an interesting paper on retrieval practice. (2) Smith, A. M., Floerke, V. A., & Thomas, A. K. (2016). Retrieval practice protects memory against acute stress. Science, 354, 1046-1048. (4) Weinstein, Y., McDermott, K. B., & Roediger, H. L. (2010). A comparison of study strategies for passages: Re-reading, answering questions, and generating questions. Journal of Experimental Psychology: Applied, 16, 308-316. (5) Smith, M. A., Blunt, J. R., Whiffen, J. W., & Karpicke, J. D. (2016). Does providing prompts during retrieval practice improve learning? Applied Cognitive Psychology, 30, 544-553. (6) Karpicke, J. D., & Roediger, H. L. (2008). The critical importance of retrieval for learning. Science, 319, 966-968. (7) Karpicke, J. D. (2009). Metacognitive control and strategy selection: Deciding to practice retrieval during learning. Journal of Experimental Psychology: General, 138, 469-486. Sep 5 Episode 1 - Welcome to the Learning Scientists Podcast!